Reveal 3. The Study Hall Skirt. When I was a kid, and sewing, my mom (the consumate 4-h seamstress) encouraged me to sew from patterns. Keep in mind I was likely not even ten yet, but I tried and became frustrated by the language and terms that where used that I had never heard before. The illustrations helped me more than the text, but sometimes they were more confusing. I can remember when I finally just stopped looking at the instructions, and instead looked at the pieces I had cut out. Cutting out was my favorite part because I knew I could do that. I loved the way it felt to push a straight pin through the delicate tissue then through the thickness of a few layers of fabric. It just felt right. Which was encouraging. But anyway. I looked at those funny shapes and started thinking about them in a new way. In a way that was maybe more like a young architect than a young sewer, and I eventually figured stuff out, and continued to sew pattern-free until I made my own patterns. My mom compared me to my aunts in Greece who would just take scissors to cloth and cut a dress pattern, knowing their daughters' sizes well enough to go free-form from the beginning. It was my most favorite comparison. It was the most inspiring comparison, no doubt. As I draft and write and illustrate this collection of patterns, I've thought so often of those young days standing at the long bar where we cut and pinned everything in our 70's style den. I try to keep my own memories of sewing being new in mind as I go, and sort of teach young me how to do it all again. The satisfaction of making it right. But not the pressure of making it right. I think that's the balance for lots of us who (wish to) pick up a needle nearly every day (if only, right?). But onto this pattern. Something else I learned VERY early in just getting dressed as a child was a disdain for waistbands. Any kind of waistbands. Elastic all the way around. Elastic just in the back. Didn't matter. I just wanted everything to sit at my upper hips, band free. Still do. Which is one of the reasons I made this skirt. My own, and I think several figure types are way more flattered by something that fits your hips well and leaves your waist alone. Isn't this why we always reach for our jeans? And this particular pattern also leaves your lower hip alone with flirty pleats front and back. 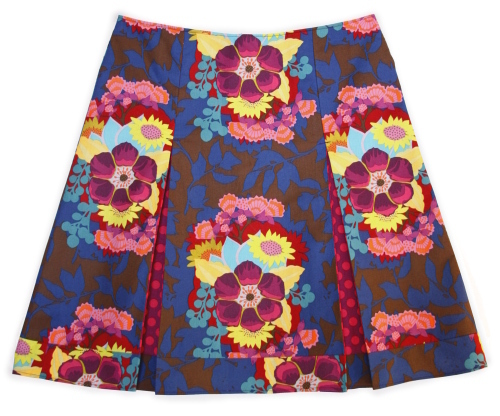 Do you remember this little skirt from way back when? I have worn that skirt everywhere, and because of that, I knew that a form of it had to be a pattern. It always feels right to wear it. Like pushing pins through pattern tissue and fabric. Right. And I love the idea of doing fancy work on the front panel like the original, should you feel the need. Don't you? It's just beautiful! My first thoughts are always for my little girls when i see cute little skirts like this one, but I actually may want this for myself!! :) It reminds me of my catholic school skirt, but way cuter and 100x cooler! :) Too bad we didn't get to wear those colors! Plaid just plaid!!! I can't wait to make this skirt! I love the contrasting fabric in the pleats! The fit looks perfect too! You're such a star. Where can I purchase this pattern?! I love it! ahh, beautiful! i love it! btw, congrats on baby #6! my husband and i are trying for our first! 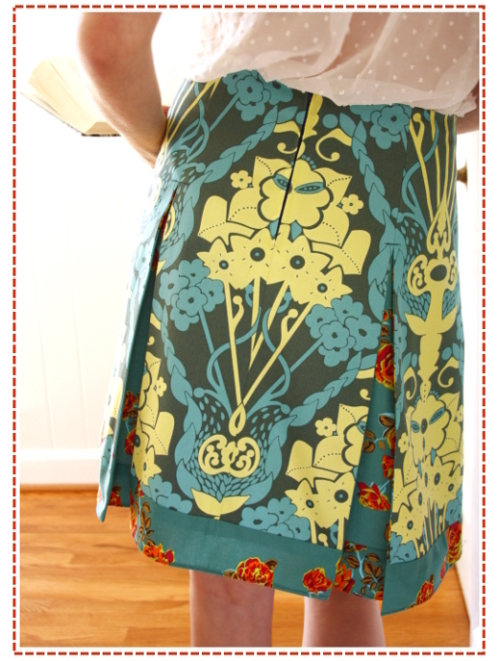 I LOVE this skirt and will make it as soon as the pattern is out. I make most things for other people, so it will be fun to have a pattern I can play with for myself. I too have problems with the instructions on patterns, so I make up my own mostly. I believe yours will be clear since you have the same issue. The more pics the better! I learn best by sitting side by side with a pro... wouldn't I just love to improve my sewing skills with you by my side! The skirt would be my first assignment... it's perfectly inspiring! SOO flippin cute! !I need to make one...or twelve! Gorgeous!!! I love the fabrics you chose, and the skirt does look *so* flattering & cute. 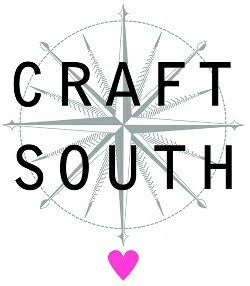 I actually went to a summer camp called "Camp Sew-What" when I was a kid, and loved sewing, but haven't even tried to sew anything in many, many years... but reading your blog is making me itch to give it a go again! I need the patterns for both of those skirts. I LOVE things that sit on my hips. Are the patterns in your book?? I agree, things at the hip (especially elastic) tend to make things too bulky. That is a very cute skirt! I cannot wait to get my hands on this pattern! I want to make a baker's dozen! So cute! 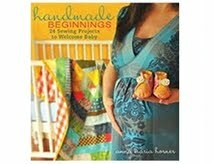 I don't usually sew clothes (quilts are easier for me), but this I have to try - one for me and one for my daughter! My grammy used to make clothes for me without patterns - I'd show her parts of dresses I liked in stores (a sleeve here, a bodice there) and she'd go home and cut her own pattern out of newspaper and come up with something amazing. My own custom designer!! i'm in love. without a sewing machine. heartbreak. 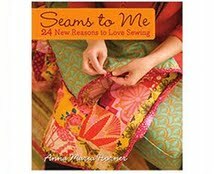 Sew Fantastic! I adore all of these patterns! I really can't wait for them to come out! You are a genius, really. I love hearing about how you can just cut out a dress from the fabric. Amazing really. Thank you. I LOVE it! And an A-line is so flattering on so many shapes, especially mine ;) Now when will we be able to buy this beauty? That is so incredibly cute! I can't wait for it to be available. I love this pattern in the darker prints - and it reminds me a bit of a uniform skirt (in a good way). So nice and straightline but with some fun. I LOOOOOOOOOVE this skirt!!!! When will a pattern be available? I can't wait to try it..
Congrats on being pregnant again!! We are trying for our first.. It reminds me of my Catholic School skirts, too! But oh so much more lively! You're so talented, thanks for all you do. I'm waiting with baited breath to get hold of your sewing patterns especially the socialite dress and this skirt and currently on with the pin cushion caddy from your book when I'm not busy stroking all the gorgeous colours in it and the fabrics I bought from you recently. What might be the quickest way for me to get hold of your patterns in England? online from one of your retailers or direct from your site? I'm off work poorly for a while and sewing with beautiful fabrics is brightening my days. Good Lord that is cute!! I must have the pattern ASAP!!!!! Well what's not to like about box pleats and no waistband? 222cute! OMG! If that was plaid and polyester blend, it would be exactly like the uniform skirt I wore through 4 years of Catholic -- all girls, to boot -- high school! I'd love to make one in cute fabric instead of the hideous plaid!! Fantastic - where and when can i buy the pattern? Greetings from Australia. This gorgeous design brings back memories of the Seventies, when I used to wear such creations. But my daughters (and granddaughters!!) would look great in this, and if I lengthened it a little, maybe I could be the spunkiest grandma in town. I'm so into skirt's this year where do I get this pattern? I NEED this pattern. NEED! Be still my beating heart, I love it! And those shoes - swoon! On another note, my grandma taught me to sew when I was little, but I have not done it since. I am working on the taxi tote right now. I hope I can do it justice! Love this skirt pattern! Where and when is it available? oh SAWEET! I LOVE LOVE the skirt. Awesome! can't wait to see your patterns, I already love your fabrics. And I must say that those shoes on the model, um please do tell who made those fabulous dreams? They are so pretty, I would just die for a pair! I always loved that patchwork skirt from the chocolate lollipop collection, so I'm excited to make my own version soon. I remember struggling to understand sewing patterns when I was a kid, but my mom was persistent in teaching me - thank goodness. I wish I could make my own like you, but then again, I'm happy to buy your patterns! I love visiting your blog everything is so beautiful. All the colors make you feel happy! Absolutely love the shoes as well! Can't wait to try out your patterns. They look too fun. Hope you get em out real soon! My mom sewed a pattern with lower pleats like this for me in high school. I liked it so much, she made me 3 or 4 out of the same pattern! This is adorable-Am I too old for this pattern...nah! I am going to go for it again-this pattern is perfect. I juist love the fabric mixing too! Love the skirt and the shoes! Where can we find the shoes??? I love skirts like that. It's a good thing she bought those shoes!!! they look great with that FAB skirt. After 53 comments you probably don't need to hear it again, but this is such a great skirt!!!! My favorite skirt is the one I sewed from a Clothkits kit... it has the same waist and it was my first skirt I ever followed a pattern on! I'm a winger... I just know what I like and then I sew it! But I would definitely follow this pattern!!! I especially love the fabric combos on these!! Love this skirt! I am mad for anything that has a contrasting band around the bottom, and this is just adorable. I just love when you talk about your family sewing in Greece, I totally "get" what you mean. It's a bittersweet feeling though, happy and thankful that I too had a seamstress yiayia but sad because I wish I had cherished those moments more. This skirt is stunning, I adore it! When and where can I purchase this pattern? !!!!!! Like others, am wondering when your latest patterns will be out? Is there a response to all these "when, when, when?" questions? What a beautiful skirt! Very eye catching. Please- all- read the previous post entitled "Squeezing a few things in...." to get the news on pattern schedule! and as always thanks so much for your interest! I love this skirt and I am dying to get my hands on all of the new patterns but, holy cow I love those shoes. Any hints where those might have come from? Oh, thank you!! I loved your original skirt and can't wait to make me a kicky pleaty one! And I'm assuming your model is your gorgeous daughter--she is soooo cute in every way! I love her/your style and wish I'd see more teenagers dressed so cool and funky without being immodest or downright oversexed, kwim? It is wonderful to see her as a model for my daughter and other cute & smart girls! WHAT a great skirt,I can't wait to make myself a couple of them, I'm so excited! Love the lack of a waistband, especially, because it's going to ride so well. 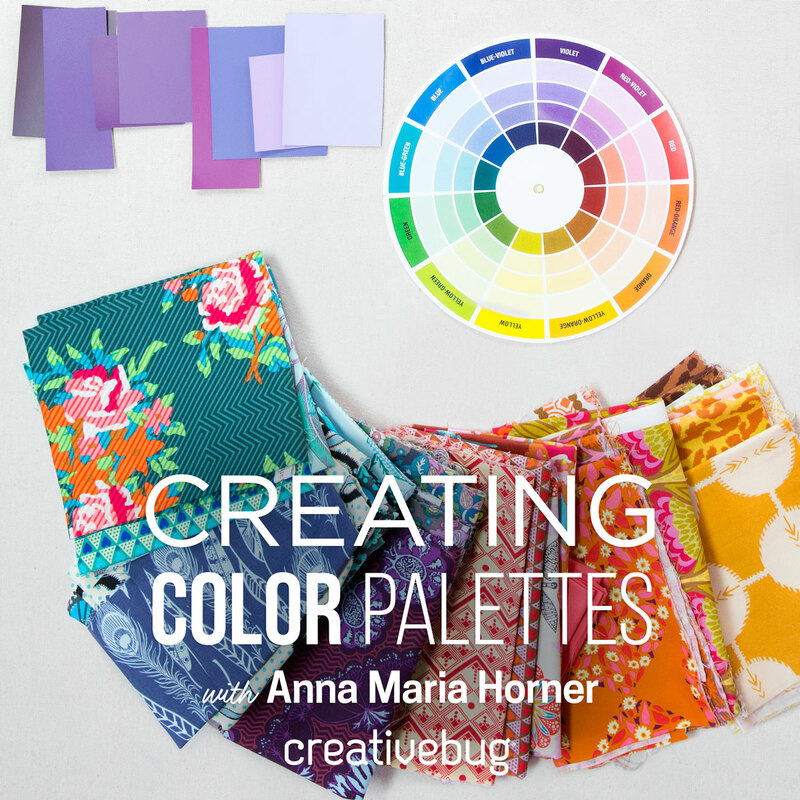 You are so talented, Anna Maria, and your fabrics are wonderful. I love reading your blog and should have said so ages ago. The skirt is awesome! I love the pleats. I too have always hated waistbands. They always seem so fussy to me to wear and to sew. Beautiful skirt. I love it's architecture. Is this pattern available to buy? It's really absolutely perfect. The fabric is gorgeous, too. I agree with you about the waistbands. I've always hated them. I've got to know where the model's shoes are from!! Do you know? For the people asking about the SHOES....i saw them on anthropologies website - they are called the 'Ruffle Row Peep-Toe' shoe. THey are $138 on the website. Happy shopping! those shoes, though...where can i find those shoes in the pattern cover? they look very Anthropologie but i can't seem to google a good description. Adorable!Love the pattern, the color, the whole works!